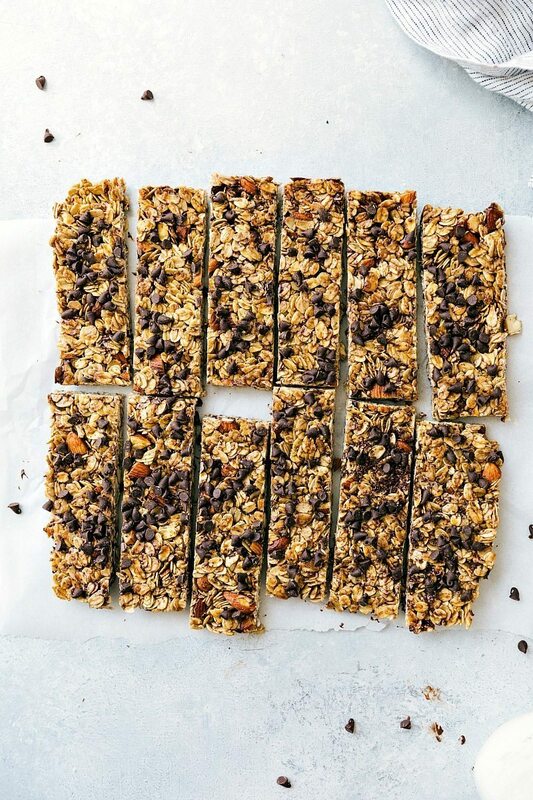 Healthy homemade granola bars made with natural sweeteners, oats, nuts, and a little bit of chocolate for good measure! My kiddos INHALE granola bars. We bring them everywhere — to the park, to the doctor’s, to the store….you can count on me always having a few in my purse or in the car ready to hand out! One of the best things about these bars though? They are crazy simple to make! I typically whip up a batch every Monday morning (and again usually on Thursday; because like I said, my kids INHALE them) and from start to finish it never takes more than 20 minutes. 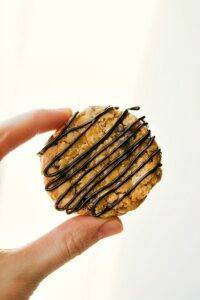 There is one step that is a little more time-consuming (and keeps these from being a true “no-bake” bar) and that is toasting the oats and nuts in the oven. 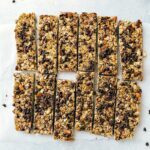 To start out these bars, you’ll pour the oats and coarsely chopped nuts on a sheet pan and roast them for about 8 minutes. This gives the nuts and oats an irresistible roasted flavor. You can swap out the almonds and cashews for whatever nuts you like best (you can even use all almonds or all cashews instead of the mix) — just make sure to coarsely chop whatever nut you use! 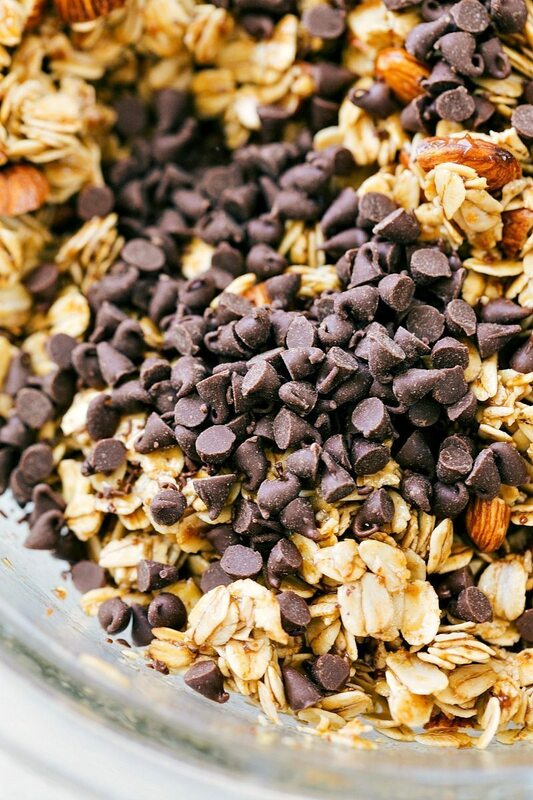 You can replace the chocolate chips with a different mix-in (think chopped craisins, raisins, or extra coconut). Just note, the chocolate does help to hold these together a bit better though. You can replace the butter with coconut oil (slightly different taste and texture, but still great), just make sure to measure your coconut oil in the hardened state. Preheat the oven to 350 degrees F. Line a large tray with parchment paper or a silpat liner. Add the oats to the pan. Coarsely chop the cashews and almonds and add to the pan. Bake for 4 minutes, stir around and bake for another 3-4 minutes or until lightly toasted and fragrant. Remove and allow to slightly cool. 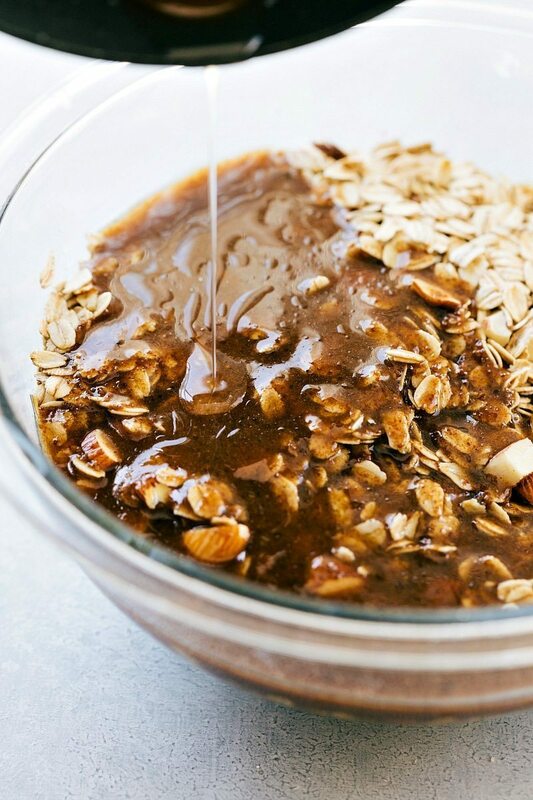 In a large bowl, combine the oat and nut mixture and the honey mixture along with the vanilla extract. If desired, stir in the toasted coconut flakes here. Let cool for a few minutes and then stir in 1/4 cup miniature chocolate chips. They get a little melted and that's intentional to hold the bars together well. Line a 9 x 9 pan with tin foil with overhang on each side to make for easy removal of the bars. Transfer the mixture into the pan and compress the bars using a rubber spatula. Press them very firmly down (this is important to avoid crumbling). 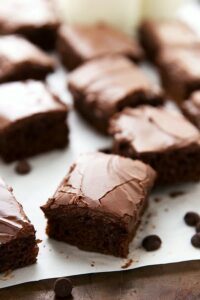 Once the mixture is very firm and evenly pressed down, add the remaining 1/4 cup chocolate chips and press those gently to adhere to the top of the bars. Cover the bars and place in the fridge for at least 1 hour and up to 3 before cutting. Using the foil overhang, pull out the bars and allow them to come to room temperature (easier to cut). Then slice into 12 evenly sized bars. Store the bars in an airtight container. (Fridge for firmer bars and room temperature for softer bars). These bars are best enjoyed within 7 days. Yummy! 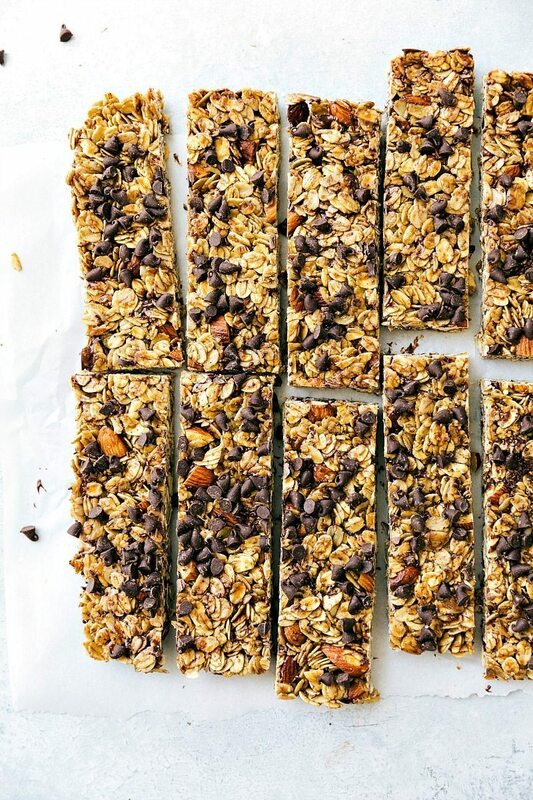 These bars look like great snacks! 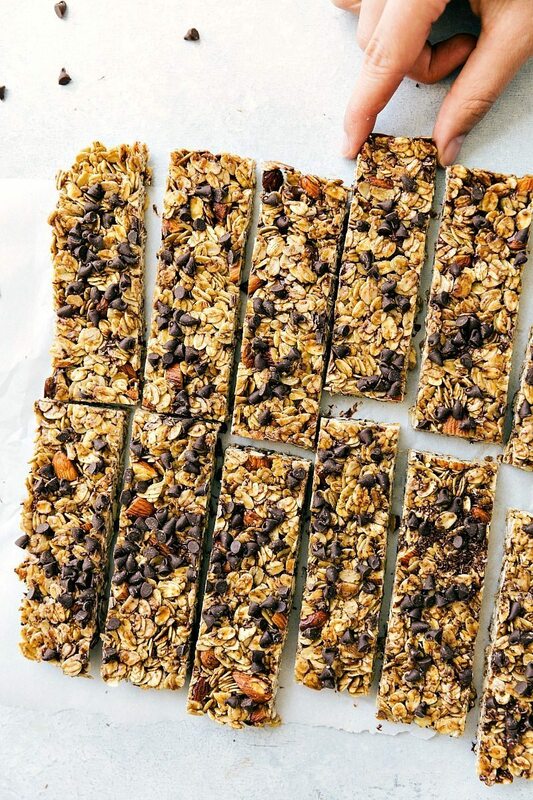 Love all your breakfast bars!!! Love the crunch factor in these! I am almost in tears wishing I could eat the ingredients in these bars because they look out of this WORLD!!! These bars looks delicious!!! I love how straight forward they are and how simple they are. Pinning 🙂 Happy 4th of July Chelsea! I LOVE the flavor and consistency of these bars! They are SO yummy and you wouldn’t think they are healthier 🙂 Is it normal for bars to come out sticky after being in fridge? They taste amazing, but are pretty sticky and messy when eaten. Thanks Chelsea! Yay!! What a great thing to hear; I’m so happy these were a hit and thank you for the comment Ashley!